Easter eggs are an annual spring rite of passage. I love them. Brightly colored, cheerful, exuberant, they are everything spring is supposed to be. I love them so much that we even dye the eggs at random during the rest of the year. A dollar egg kit from the store, a bottle of vinegar, and a bit of water is all you need for the standard egg. If you want a stand out egg... add some vegetable oil. - Hard boil eggs and let them cool. Really, you could dye uncooked eggs but with kids this is risky. And if you use extra vinegar they may not cook well later. - Warm several cups of water and make the dye. For really bright eggs, ignore the 1/2 cup of water to 3 tablespoons of vinegar, half-n-half is better. 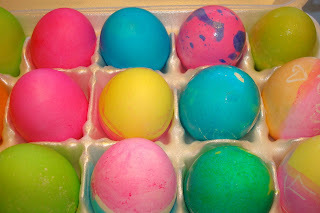 - Dye the eggs the base color you want. Always start with a lighter color. Dark layers over light, but light won't layer over dark. 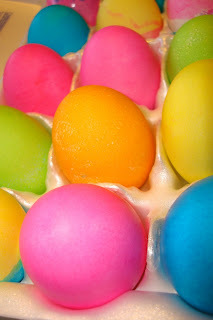 - When all your eggs have a base color, add a tablespoon of oil to each dye cup (or divide the dye and add). Swirl the oil in the cups and slowly lower the egg in a circular motion. Where the oil sticks, the dye won't. With a lot of oil you'll get something like the pink and blue speckled egg above. 1. White crayons were invented for a reason. Write on the egg shell before dying and you can make names, shapes, and messages appear. 2. For a lighter color use less vinegar, or dip the egg quickly and wash off the excess before it dries. For pastel colors as the base for your swirls mix the dye and the water, add the vinegar later. 3. Remember your color wheel: blue + pink = purple.... blue + orange = yuck! 4. Perfect eggs aren't fun. They may make an eye-catching center piece, but the blue, red, and green egg will be the talk of the table. Let the kids have fun. And don't let them wear their new Easter clothes to the dying table!